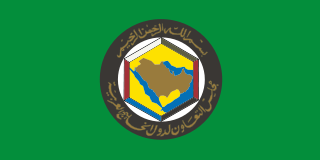 The Arab states of the Persian Gulf are the seven Arab states which border the Persian Gulf, namely Bahrain, Iraq, Kuwait, Oman, Qatar, Saudi Arabia and the United Arab Emirates (UAE). This excludes the non-Arab state of Iran. All of these nations except Iraq are part of the Gulf Cooperation Council (GCC), and prefer to use the term "Arabian Gulf" rather than the official and historical name of the Persian Gulf. 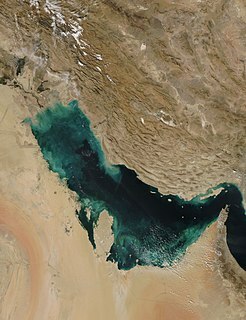 The Persian Gulf is a mediterranean sea in Western Asia. The body of water is an extension of the Indian Ocean through the Strait of Hormuz and lies between Iran to the northeast and the Arabian Peninsula to the southwest. The Shatt al-Arab river delta forms the northwest shoreline. Kuwaiti popular culture, in the form of dialect poetry, film, theatre, radio and television soap opera, flourishes and is even exported to neighboring states. Within the Arab states of the Persian Gulf, the culture of Kuwait is the closest to the culture of Bahrain. There is a rich and ancient culture in Eastern Arabia. Eastern Arabia's culture has always been oriented towards the sea. While being Arab at its core, it has been heavily influenced by the cultures of Persia, South Asia and Horn of Africa, because of extensive trade links. Battoulah is a mask traditionally worn by Muslim Arab women in Arab states of the Persian Gulf, including Bahrain, Kuwait, Saudi Arabia, United Arab Emirates, Oman and Qatar, as well as in southern Iran. Origin of battoulah is unknown, but its thought to have entered Eastern Arabian Peninsula from Gujarat in late 18th century. The 23rd Arabian Gulf Cup was the 23rd edition of the biennial football competition for the eight members of the Arab Gulf Cup Football Federation. It took place in Kuwait from 22 December 2017 until 5 January 2018. Oman won their second title, defeating the United Arab Emirates in the final on penalties following a goalless draw.